Banana fritters, commonly known as pisang goreng is an affordable tea time snack that goes well with coffee, tea and even vanilla ice cream. 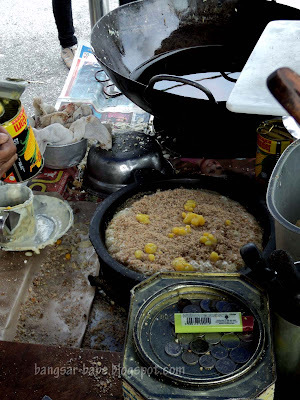 We happened to be on the way to Ipoh, when rif decided to stop by Teluk Intan to buy some pisang goreng. 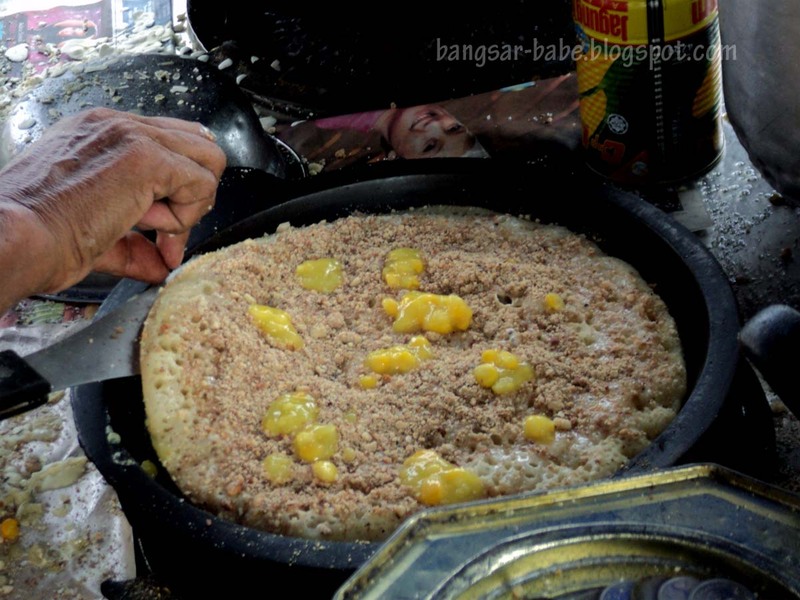 According to him, the batter is especially crunchy, and the fritters will remain crispy even after a few hours. The stall is located nearby the leaning clock tower, next to the Shell petrol station (see picture). 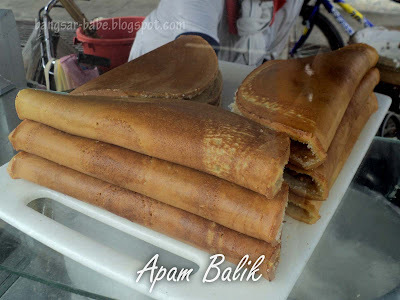 I also saw the lady making apam baliks (RM1.50 for whole), which looked quite promising. I ordered one, and 9 banana fritters (3 for RM1). He was right — the batter was crispy; almost crackers-like. Sadly, not all the bananas were sweet that day. I only ate two sweet fritters, while the rest were only mildly sweet. The good thing about these fritters is that they don’t smell or taste ‘old’. A lot of vendors these days use recycled oil, so the fried items tend to have an unpleasant smell and taste. The apam balik was nothing to shout about, but I liked how generous the lady was with the ‘liu’. It has plenty of canned corn, ground peanuts, sugar and margarine. 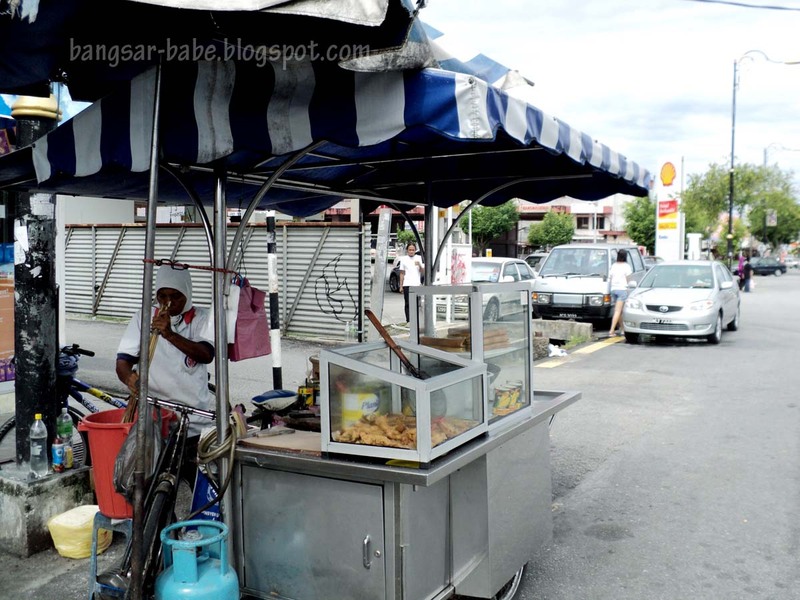 There are a few stalls along the road. I went to the last stall, next to the petrol station. Verdict: Pop by for a teatime snack when you happen to be around. Fyi, do you know some traders put in plastic (yes, plastic!!) 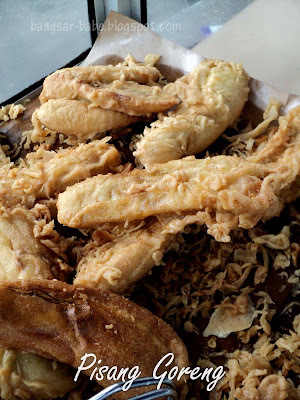 before goreng the pisang so that they remain crispy? i have not eaten pisang goreng since i heard this..
i don't know how true is the whole plastic business or if that's just a hoax though, seriously. I wouldn't blame you cos I thought it was a hoax too until I read it in The Star paper that someone actually had the plastic protruding out of her pisang goreng. I guess the trader failed to completely goreng the plastic in this case. yeah i heard plenty of "rumours" as to how they make it crispy. 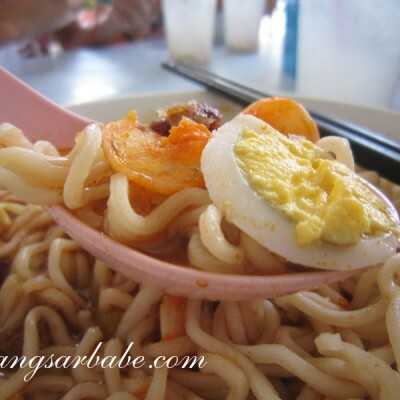 but if you don't want to travel to teluk intan, the guy at brickfields, opp YMCA does a very good job too. plastic thing is rubbish la. Many said about plastic in possibly everything deep-fried. Fried shallots, bananas, chicken etc. Then what? Eat only steamed foods? i find the banana fried in KL is always "force to ripen". i cant remember the name of the chemical they use to force the banana to ripen but i know for a fact these orchard farmers use it (uncle use to supply fruits to KL and according to him its "normal"). the good thing about eating pisang goreng in the Kampung's is that you know you are getting quality banana. 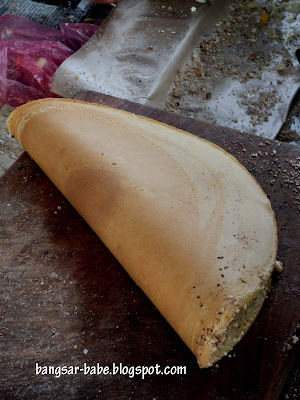 what BB failed to mention in the post was that Teluk Intan pisang goreng is known for its fan shape. you usually find 1 pisang goreng cut to 3 parts in KL to look like a fan but in Teluk Intan you will find that 1 pisang goreng is cut to 4-5 parts to look like a huge fan. 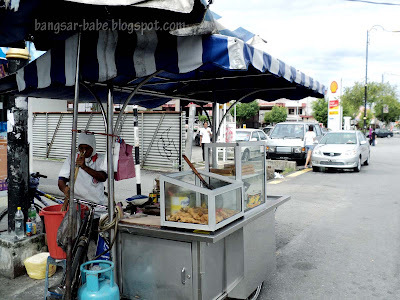 for some reason the day that we went there the pisang goreng was not fried like the way i used to remember. the plastic thing is REAL… people… if the pisang goreng remain crispy after quite sometime… try and burn it… it is not a HOAX…. they use clear plastic bag, melt it in the hot oil first… then after all melted, they start fries all the pisang.. even some fried chicken also the same… if the flour skin stay crispy after some time… its all plastic got to do with it.